Shaanxi (pinyin: Shǎnxī; Mandarin pronunciation: [ʂàn.ɕí] (listen); formerly romanized as Shensi), is a province of the People's Republic of China. Officially part of the Northwest China region, it lies in central China, bordering the provinces of Shanxi (NE, E), Henan (E), Hubei (SE), Chongqing (S), Sichuan (SW), Gansu (W), Ningxia (NW), and Inner Mongolia (N). It covers an area of over 205,000 km2 (79,151 sq mi) with about 37 million people. 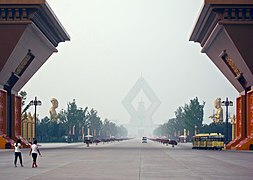 Xi'an – which includes the sites of the former Chinese capitals Fenghao and Chang'an – is the provincial capital. Xianyang, which served as the Qin dynasty capital, is located nearby. The other prefecture-level cities into which the province is divided are Ankang, Baoji, Hanzhong, Shangluo, Tongchuan, Weinan, Yan'an and Yulin. The 1556 Shaanxi earthquake or Huaxian earthquake (simplified Chinese: 华县大地震; traditional Chinese: 華縣大地震; pinyin: Huáxiàn Dàdìzhèn) or Jiajing earthquake (Chinese: 嘉靖大地震; pinyin: Jiājìng Dàdìzhèn) was the deadliest earthquake in recorded history, killing approximately 830,000 people.It occurred on the morning of 23 January 1556 in Shaanxi, during the Ming Dynasty. More than 97 counties in the provinces of Shaanxi, Shanxi, Henan, Gansu, Hebei, Shandong, Hubei, Hunan, Jiangsu and Anhui were affected. Buildings were damaged slightly in the cities of Beijing, Chengdu and Shanghai. An 840-kilometre-wide (520 mi) area was destroyed, and in some counties as much as 60% of the population was killed. Most of the population in the area at the time lived in yaodongs, artificial caves in loess cliffs, many of which collapsed with catastrophic loss of life. Baoji (simplified Chinese: 宝鸡; traditional Chinese: 寶雞; pinyin: Bǎojī) is a prefecture-level city in western Shaanxi province, People's Republic of China. Since the early 1990s, Baoji has been the second largest city in Shaanxi. Fugu Airport (Chinese: 府谷机场) is an airport being constructed to serve Fugu County in northern Shaanxi Province, China. It is located near Sangyuanliang Village, Fugu Town.The airport project was launched by the Fugu County government in 2009, and received approval from the State Council of China and the Central Military Commission on 23 January 2019. It will be the first county-level airport in Shaanxi.The airport will have a runway that is 2,800 metres (9,200 ft) long and 45 metres (148 ft) wide (class 4C) and four aircraft parking places. It is projected to handle 450,000 passengers and 1,200 tons of cargo annually by 2025. Huayin is a county-level city in Weinan, Shaanxi province, China. Prior to 1990, Huayin had been regarded as a county. Huayin literally means to the north of Mount Hua, because it is situated to the north of that mountain. Shaanbei (simplified Chinese: 陕北; traditional Chinese: 陝北; pinyin: Shǎnběi) is the northern portion of Shaanxi province in Northwest China, and is a natural as well as cultural area, forming part of the Loess Plateau. As it includes Yan'an, it is known as the birthplace of the Chinese Communist revolution. The Shaanxi Y-8 or Yunshuji-8 (Chinese: 运-8) aircraft is a medium size medium range transport aircraft produced by Shaanxi Aircraft Corporation in China, based on the Soviet Antonov An-12. It has become one of China's most popular military and civilian transport/cargo aircraft, with many variants produced and exported. Although the An-12 is no longer made in Ukraine, the Chinese Y-8 continues to be upgraded and produced. An estimated 169 Y-8 aircraft had been built by 2010. Shaannan (simplified Chinese: 陕南; traditional Chinese: 陝南; pinyin: Shǎnnán) is a region referring to the southern portion of Shaanxi province, China. Its name derives from the abbreviation of the province Shaan (陕), combined with its geographical location within the province (南). Much of the region is south of the Qin Mountains as well, and for this reason it was for long part of varying kingdoms known as Shu, which also included parts of the Sichuan Basin. In the Yuan Dynasty, the area began to be merged with what is the Guanzhong Plain to form Shaanxi Province. This barrier has also created major differences in climate, cultural traditions and language between Shaannan and the central and northern parts of Shaanxi, and thus there is some similarity between Shaannan and Sichuan. Weinan (Chinese: 渭南; pinyin: Wèinán) is a prefecture-level city in the east of Shaanxi province, China. The city lies about 60 km (37 mi) east of the provincial capital Xi'an. Xi'an ( SHYAHN, also UK: shee-AN, US: shee-AHN, Chinese: [ɕí.án] (listen)) is the capital of Shaanxi Province, China. A sub-provincial city on the Guanzhong Plain in northwestern China, it is one of the oldest cities in China, and the oldest of the Four Great Ancient Capitals, having held the position under several of the most important dynasties in Chinese history, including Western Zhou, Qin, Western Han, Sui, and Tang. Xi'an is the starting point of the Silk Road and home to the Terracotta Army of Emperor Qin Shi Huang.Since the 1990s, as part of the economic revival of inland China especially for the central and northwest regions, the city of Xi'an has re-emerged as an important cultural, industrial and educational centre of the central-northwest region, with facilities for research and development, national security and space exploration. Xi'an currently holds sub-provincial status, administering 9 districts and 4 counties. As of 2018 Xi'an has a population of 12,005,600, and the Xi'an–Xianyang metropolitan area a population of 12.9 million. It is the most populous city in Northwest China, as well as one of the three most populous cities in Western China, the other two are Chongqing and Chengdu. In 2012, it was named as one of the 13 emerging megacities, or megalopolises, in China. Xianyang (Chinese: 咸阳; pinyin: Xiányáng) is a prefecture-level city in central Shaanxi province, situated on the Wei River a few kilometers upstream (west) from the provincial capital of Xi'an. 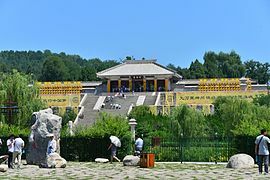 Once the capital of the Qin dynasty, it is now integrated into the Xi'an metropolitan area, one of the main urban agglomerations in inland China, with more than 7.17 million inhabitants, its built-up area made of 2 urban districts (Qindu and Weicheng) was 945,420 inhabitants at the 2010 census. It has a total area of 10,213 square kilometres (3,943 sq mi). Yan'an (Chinese: 延安; Mandarin pronunciation: [jɛ̌n.án]) is a prefecture-level city in the Shanbei region of Shaanxi province, China, bordering Shanxi to the east and Gansu to the west. It administers several counties, including Zhidan (formerly Bao'an), which served as the headquarters of the Chinese Communists before the city of Yan'an proper took that role. Yan'an was near the endpoint of the Long March, and became the center of the Chinese Communist revolution from late 1935 to early 1947. Chinese communists celebrate Yan'an as the birthplace of the revolution. Yulin (Chinese: 榆林; pinyin: Yúlín) is a prefecture-level city in the Shanbei region of Shaanxi province, China, bordering Inner Mongolia to the north, Shanxi to the east, and Ningxia to the west. It has an administrative area of 43,578 km2 (16,826 sq mi) and a population of 3,380,000. Yulin Xisha Airport is a former airport in Yulin, Shaanxi China. The official Yulin airport codes were changed to the new Yulin Yuyang Airport when the latter was opened in March 2008. Yulin Xisha Airport was the first airport in Yulin, officially opened in 1988, but the planned expansion of the airport was cancelled when it failed to meet the requirements for new developments. Instead, the construction of a new airport was ordered and Yulin Xisha Airport has been demolished.The airport has one runway (15/33) that is approximately 1,500 metres long. Yulin Yuyang Airport (IATA: UYN, ICAO: ZLYL) is an airport serving the city of Yulin in Shaanxi Province, China. The airport opened in March 2008, replacing the old Yulin Xisha Airport. The airport is located 15.5 km (9.6 mi) from the urban area of Yulin. Its construction started in 2005 and it was classified as a 4C grade civil regional airport.